NOW HERE’S A strange thing. As I was saying goodbye to Marlene Yon in the breakfast room of Susan’s Town House, I got just a little choked. I’d only known Marlene for four days and had hardly had a proper conversation with her, so it took most of a day to work out that she had brought back memories of the forgotten women of my childhood, those kindly bringers of breakfast and cake. In the North Riding of Yorkshire in the 1950s and 60s, the dress code for women was usually a navy frock flecked with white spots and a permanently attached pinny. In Susan’s Town House, Jamestown, St Helena, Marlene had worn the white coat and white nylon hat uniform occasionally seen in butcher’s shops in Britain as she cooked breakfast. And like my barely-remembered relatives, she left us cake under a little cloche so that we could do damage to our waistlines whenever we wanted to. St Helena is said to be the most remote island in the world: it takes a week to get there from London, including five days out and five days back on the last Royal Mail Ship, the RMS St Helena. The average wage on the island is £7,000 a year, which is low by UK standards. One result is that the RMS – geared to the interests of islanders (they call themselves Saints) rather than tourists – is like a floating 1960s holiday camp, with cost-effective quizzes and pub games intermingled with film nights and deck quoits and bridge and cricket. There was even a Beetle drive and a pot of beef tea in the afternoons. It was like going home. On the streets, people stop and talk to each other – just as they did when I was a boy – and everybody waves to and from passing cars. On one especially tight corner close to Longwood House, where Napoleon Bonaparte died, a Saint leaned out of his car and asked our young driver, pointedly: “Who dat?” He was looking directly at me. In the White Horse, one of Jamestown’s handful of public houses, 60-year old Boy Dobbs – who combines the positions of barman and undertaker – told us he was too busy with funerals to let us play darts. So, we drank beer with him instead, and talked about the airport that is due to open in 2016 and the impact it would have on the local economy. And then there were those things that were not like Yorkshire, either today or at any time in the past: the home-grown coffee Stephen Biggs served us on the verandah of his elegant guest house, Farm Lodge; the red-billed tropic birds and fairy terns that tumbled across the corrugated roofs of Jamestown; the runaway flax plants that blight the valleys now that the flax industry has been killed off by plastic; the pod of hundreds of pantropical spotted dolphins that surrounded the tiny boat captained by Anthony Thomas of Sub-Tropic Adventures; the eucalyptus trees and date palms; the winter sunshine; the charming Aaron Legg, who pushed his Mitsubishi Delica – a kind of 4×4 microbus – into surreal places for our entertainment. 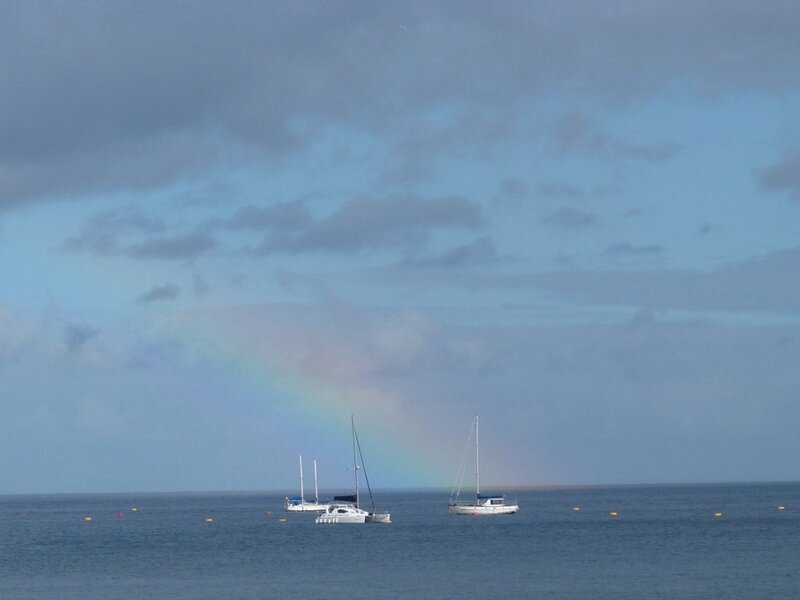 St Helena is both British – it is one of our overseas territories – and foreign. The police wear recognisably British uniforms and the island is littered with ancient British saloon cars. But it is also topped with a dripping cloud forest, and ringed by an arid coastline full of prickly pears – the fruits of which are distilled by Paul Hickling and his partner Sally to make a grappa-like spirit called Tungi. Paul used to have a business servicing slot machines that took him to the garrisons of the Falkland Islands, and from there to St Helena where he settled. The distillery (the remotest in the world, of course) is a relatively new venture. At the top of the island, near the high point of Diana’s Peak, there is a place near Fairyland where I took a tumble, slipping on the cloud-forest-wet last step of a three step flight. I ended up flat on my back looking at the sky, while being scrutinised by a donkey. In this way, I fell both in and for St Helena. The island has a Governor appointed by HM Queen Elizabeth – Mark Capes – whose lovely wife Tamara invited us for tea at their residence, Plantation House. Outside, the Governor’s official car didn’t have a number on its number plate, just a crown. Inside, we had more cake and samosas in a room created by Napoleon’s British jailer, Sir Hudson Lowe. Strangely, the islanders don’t make much of Napoleon. Sure, there are the expected tours to The Briars – where he spent his first few weeks in exile – and Longwood House (no pictures, please). But the islanders themselves don’t seem to talk about the Emperor much: I’ve read that his years of exile imposed painful restrictions on the local population. Unsurprisingly, however, the French are quite keen (they own Longwood House) and are gearing up for 2015 – two hundred years after Napoleon came second in the Battle of Waterloo and began his six year exile on St Helena. There are places in the world that you travel to and find that when you arrive there’s not much there, and not an awful lot to do. Curiously, many of them have become tourist destinations. St Helena is not like that at all. St Helena is a dark-sky destination – when there is no moon the island is lit by the soft light of the Milky Way and there are more stars in the sky than there have ever been in Hollywood, or are ever visible from the UK. Halley – of comet fame – spent time here studying the heavens. It is a birding destination – the St Helena Plover or Wirebird is one of the rarest creatures on the planet, on the list of most endangered species. It is a hiker’s dream with forest walks and toe-curling scrambles along volcanic ridges with sheer drops on either side. There is big game fishing and scuba diving and more than enough to attract the amateur historian: apart from Napoleon, we Brits also imprisoned thousands of Boers here in tented camps, and there is a Boer cemetery that attracts Afrikaners tracing lost forebears. And if you are interested in natural history, there are few places as compelling – Darwin described St Helena as “the Galapagos of the Atlantic”. And, yes, he stopped here too – as did Captain James Cook. The only trouble St Helena has with tourism is that it is a very, very long way away from anywhere. Even Cape Town, where airline passengers board the RMS, is still 1,700 miles away – a journey undertaken by the little ship at the speed of an enthusiastic Sunday cyclist. And so the Brits – via the Department for International Development (DfiD) – are funding an airport on the island. In civil engineering terms, it is a vast undertaking with contractor Basil Read slicing the top off a hill and using the resulting waste to fill entire valleys, creating an 8 million cubic metre embankment in the process. But it is going ahead, and it will open in 2016 – at which time UK government funding of the RMS St Helena will cease. The story is that the little ship will be sold for scrap*. The DfiD website reveals that the whole life cost of the airport will be more than £445 million over 40 years. The island has a tiny population – around 3,800 – which, just to put it into perspective, is smaller than that of Mayfair in London, and less than half the membership of my London club, the Lansdowne. Will the gamble pay off? Nobody really knows. There have been reports that St Helena could eventually attract up to 30,000 tourists a year, although I haven’t found many yet who take that forecast with anything but a large pinch of sea salt. 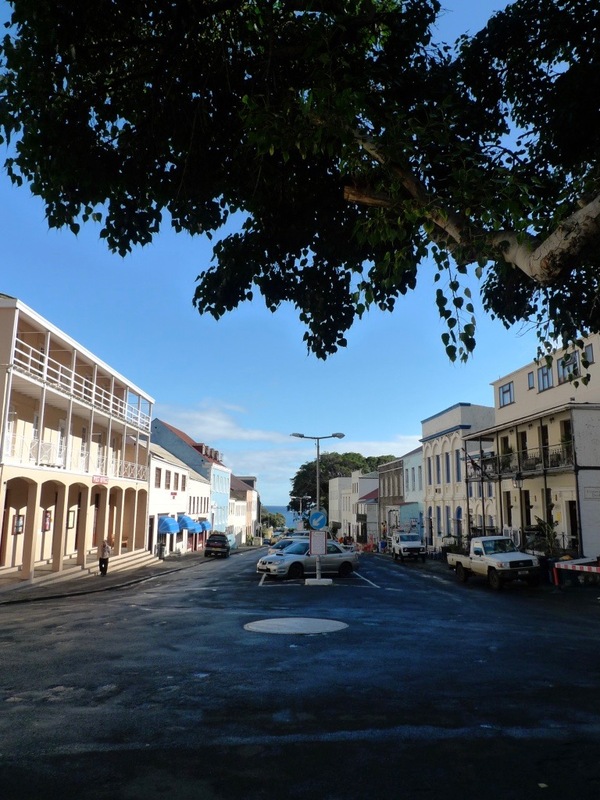 Steady growth from a low base seems more likely, which is why the hotel developers are waiting until details are released of the airlines bidding for the right to fly to St Helena, later this year. They will want to know what capacity the planes have and whether they are direct with a refuelling stop, or indirect – via Cape Town, for instance. Meanwhile, eight bids have been received – based on various economic models – for the right to provide freight services by sea to the island: essential, since liquid petroleum gas, explosives and cars can’t really be flown in once the RMS has gone. So, the island, the developers and the hoteliers are all holding their breath, waiting to see what happens. And that provides a window of opportunity for the more adventurous traveller. 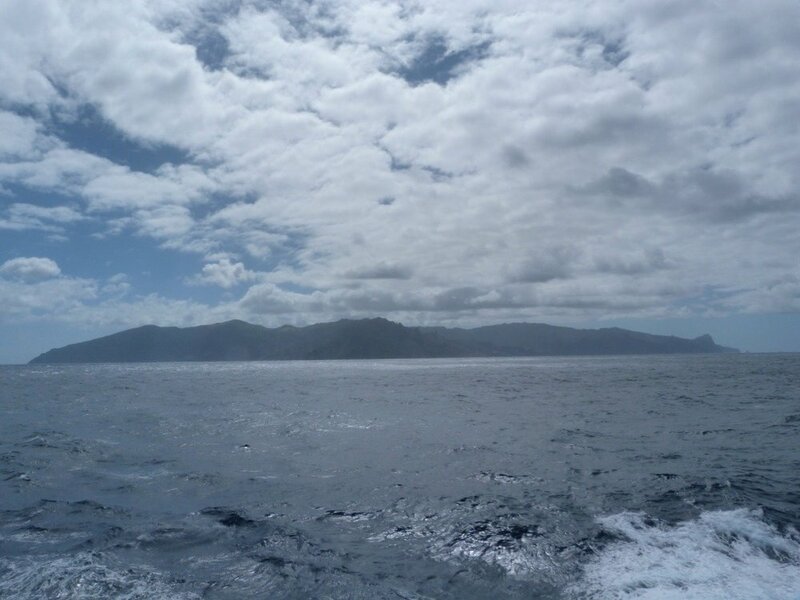 Getting to St Helena by sea is, in my book, A Very Big Adventure – and there is just a year or so in which to do it. The ten days on the RMS is part of the deal: for me, it was a meditative, almost monastic experience, in which my resting heart rate dropped to something approaching the athletic. The landscape is startling, but thinking over our short trip it’s the people I remember most: Marlene and Colin Yon, providing a homely service to guests at Susan’s Town House; Stephen Biggs and his long-term partner Maureen, producing a superior dinner at Farm Lodge – probably the best meal of the year so far – amid much leg-pulling and foolery; Anton and Cathy Alberts (Director of Tourism) hosting a splendid meal for us at the Orange Tree asian restaurant; Bert Constantine and Adrian Legg, our drivers; Gillian Moore, a former English restaurant inspector, at the 2onMain training restaurant; Hazel Wilmot showing us around the Consulate Hotel on Main Street – where there is a key development opportunity; and all of those good people whose names I failed to record, but who made us feel so much at home. On the RMS, I chatted to a crew member and asked her what she was going to do when the ship is decommissioned. She said: “I’m going to retire.” I was thinking, “You’re way too young”, when she added: “What’s the point of waiting till you’re old?” Her argument was that she already had enough, and that she didn’t really want much more than to be happy on the island with her family. In a period of growing wealth inequality, there may be a lot to learn from these people. * The first passenger plane, carrying 60 people, flew into St Helena Airport in May 2017 after dangerous levels of wind shear (discovered on completion) had earned it the soubriquet of the 'most useless airport in the world'. I went to St Helena as a representative of Halcyon Travel Collections Ltd and as a guest of the St Helena Tourist Board. Click on the picture below to see more.